As our thirst for gin continues, so does our appreciation of its wider context. The history of gin has been well-documented. From the birth of Genever to the 1700s ‘Gin Craze’, from the plague doctors’ botanical masks to the 21st century explosion of micro-distilleries, we all know and love recounting anecdotes about gin’s continual evolution. Alongside quaffing our favourite drink, we have learnt a lot about juniper. This evergreen shrub provides the heart and soul of our tipple, but what do we know about the other botanicals? The fruit, nuts, herbs and spices which form the full expression of our gin. If juniper creates gin’s structure, the other botanicals weave melodies, harmonies and complex rhythms. None more so, perhaps, than spice. A spice is defined by being a seed, fruit, root, bark or other plant substance used for flavouring, colouring or preserving food. Herbs differ by being the leaves, flowers or stems. Humans have been experiencing the benefits of spice for millennia. World trade has been negotiated over seeds and roots, battles have been fought and new countries discovered due to explorers racing around the globe in a bid to be the first to discover these exotic flavours. 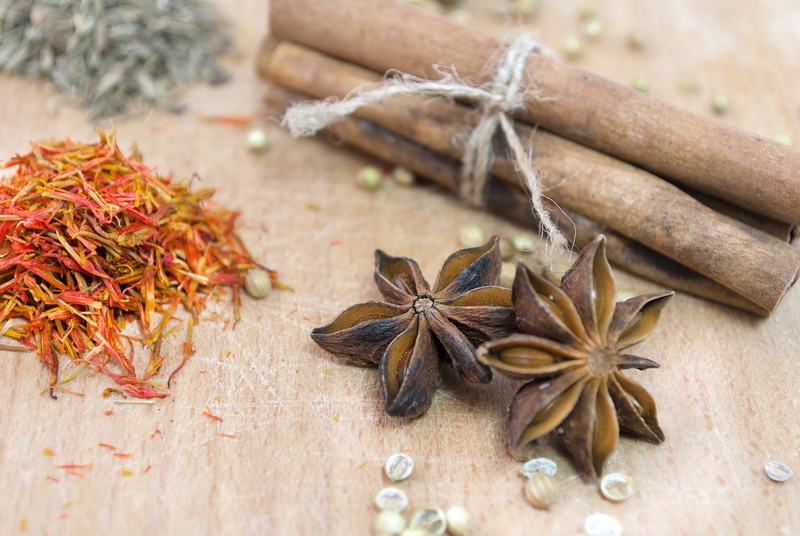 Spices form an integral part of gin’s history and a vital role in its production. Whilst ‘spiced gin’ has not emerged as a category itself, (practically every gin would count) the prevalence of introducing new, unusual and distinctive flavours continues. The ancient, adventurous history of the spice trade began around 2000BC. Spices have long been associated with medicine, religion and magic alongside their traditional role of preservation. It wasn’t just food being preserved, the Ancient Egyptians used a concoction of spices during their mummification and burial rituals. The oldest spices to be widely traded are believed to be black pepper, cinnamon and cloves. Historically, spices have been reserved for the wealthy due to the great expenses incurred by transporting them across the globe. As with many commodities, new and exotic flavours were claimed by the aristocracy as a sign of wealth, influence and power. During the Middle Ages, a pound of ginger cost as much as a sheep, while a pound of saffron was worth the same as a horse. Pepper was the most common spice traded and found its way into currency, becoming known as ‘black gold’. Pepper could be used as a substitute for money with landlords often being paid a ‘peppercorn rent’. Wealthy brides received pepper as their dowry. With approximately 200 flowers required to produce one gram, saffron remains the most expensive spice in the world with a value higher than gold. Saffron was often mixed into hot teas and believed to cure bouts of melancholy. In recent years, we have seen a handful of saffron-led gins appear on the market, distinct in their yellow-orange colouring and hay-like aromas. The potency of spice is reduced when dried or ground, yet this is the most effective method of preservation. Gin producers will need to decide whether they use fresh or dried spices in their recipes and how this will scale up over time. It may be idyllic for a small producer to hand-grate nutmeg or crush cardamom pods, but realism must also be acknowledged. The early medical profession, (along with local folklore) first recognised the preventative and healing properties of spices. Many spices are high in anti-oxidants and have anti-microbial benefits. In 1555BC, in Ancient Egypt, coriander, juniper, fennel and cumin were classified as health-promoting spices. Alternatively, Chinese culture believes those who eat coriander seeds will achieve immortality. As well as being used in food preservation and medicinal ointments, spices were regularly added to beer, wine and spirits. Sourcing spices was a difficult and treacherous journey. Long voyages were accompanied by threats from other powerful empires intent on dominating the trade routes. To protect their assets and deter others, elaborate stories were woven detailing the dangers encountered, for example it was told that cinnamon could only be harvested from deep glens infested by poisonous snakes. The archives of gin’s history are interwoven with that of their botanicals and intrepid discoveries. To be successful in today’s burgeoning market, a gin producer must also become a storyteller. Gin lovers are devouring information as quickly as they are ordering another G&T. The team behind Opihr Gin is taking the lead by stating ‘Oriental Spiced Gin’ on the label and creating a sense of exploration. It focuses on the route its botanicals have taken and guides its drinkers across the globe. This added level of interaction engages the consumer and increases their affiliation with the brand. Similarly, Germany’s Elephant Gin not only works tirelessly to raise awareness and money for two incredible African elephant charities, it highlights a sense of adventure, depicts old-fashioned maps and invokes nostalgic memories. The botanical recipe utilises native African herbs and spices, including Devil’s Claw which is used in folk medicine to reduce pain. Spice has a fantastic ability to conjure up imagery, transporting our tastebuds to far-flung lands. Another brand championing spice in a different manner is Bertha’s Revenge from the Republic of Ireland. The use of whey as the base spirit created some interesting experiments when trialling its botanical recipe. Owners Justin and Anthony discovered that spice characters translate incredibly well over the creamy texture and rich mouthfeel. A category which continues to flourish and expand is that of Old Tom gin. Producers are experimenting with botanical methods of sweetening opposed to the addition of sugar. Being 50 times sweeter than sucrose, liquorice is the ideal partner. During the 18th century, gins were sweetened to mask off-flavours and other unsavoury additions. The use of spice has similarly been used to camouflage lower quality drinks. Today we are fortunate to have quick and easy access to botanicals from all over the world, with far lower transportation costs and minimal risks of spoilage. There are so many different fruits, herbs and spices available that we are still afforded the luxury of discovery. Weird and wonderful flavours are entering our gin cabinets. Even with a set list of botanicals, the differences in proportions used, their countries of origin and their state, (fresh or dry, whole or powdered) all create limitless expressions of flavour and character. With new gins being released on the market at an unstoppable rate, producers are either turning towards sourcing more obscure spices or focusing solely on those thriving in a specific area. The trend for creating a ‘signature serve’ has enabled producers to incorporate additional ingredients as garnishes. However, the simplest way of integrating spice into our drinks appeared with the creation of the hot toddy. Traditionally, whisky or brandy would have been the spirit of choice, but gin has long been added as an alternative. Hot toddies are renowned for their medicinal, cure-all properties, mainly due to the soothing quality of warmth and the anti-bacterial benefits of the spices. A hot toddy recipe can be easily adapted to personal tastes, but the core elements are alcohol, sugar, spices and hot water. The alcohol and spices can vary, the sugar can be replaced with honey and a slice of lemon may also be added. Its comforting warmth and versatility make it the perfect cocktail for a cold winter’s night. 1. A doctor named Robert Bentley Todd prescribed a drink of hot brandy, cinnamon and sugar water to his patients. 2. Three Foxes Well near Edinburgh was known locally as Tod’s Well. It was one of the few sources of clean water in the area. Whisky was considered medicinal, but not everyone liked to drink it neat. The addition of the healthy water and some spices made it more palatable. When contemplating which spices to add to your hot toddy, it is important to consider which gin you’re using. Typically, you cannot go far wrong with rich, earthy spices, such as cinnamon, nutmeg or clove. However, you may like to lift certain elements by trying star anise, cardamom or liquorice. As you curl up with a blanket, hands wrapped around your favourite glass, take a moment to reflect on the long, often dangerous journey the components of your drink have taken to reach you. Spice can contribute many different elements from the lemony lift of coriander to the earthy richness of cinnamon or the menthol sweetness of liquorice. Cast your eye over the list of botanicals on your gin bottle and contemplate the countries, cultures and characters which have influenced the ingredients. As the gin category continues to grow, so too will our experience. Enjoyed re-collecting the history behind this. Thank you.